The report -- “Ranking the States by Fiscal Condition” -- used official government data to measure the states’ ability to pay short-term bills and meet longer-term obligations, such as public pensions or health care costs, using five separate measures. Cash solvency, for example, measures a state's ability to pay its immediate bills. Budget solvency measures whether states will end the year with a surplus or deficit. Long-run solvency looks at a state’s ability to meet long-term spending commitments. Service-level solvency measures a state’s ability to respond to a demand for increased spending. And trust fund solvency measures unfunded pension liabilities and state debt. States can do well on some measures and poorly on others. Alaska, for example, ranks at the top for cash, budget and long-run solvency, but near the bottom on the other two measures. Ohio ranks fifth in cash solvency, but 48th on trust fund solvency. This year’s report includes Puerto Rico, which scored dead last on every measure. The report also provides an overall ranking of the states. And while Mercatus makes no mention of the states’ political leanings, every state in the top 10 except for Florida is solidly red, meaning those states voted for the Republican in each of the past four presidential elections (see table). And Florida has had a Republican governor since 1999, and the state House and Senate are both controlled by Republicans. 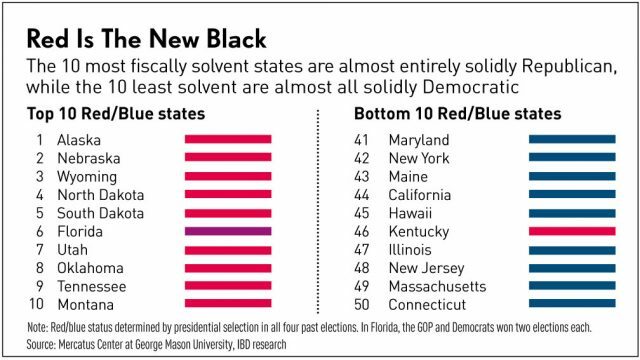 At the other end of the spectrum, except for Kentucky, the 10 worst states are all solidly blue. And all but two of the governors since 1947 have been Democrats. Politicians, especially the “pragmatic” ones, are always talking about how they are just interested in what works. When it comes to keeping spending, debt and long-term liabilities under control, the place to look seems obvious. The conservative approach of lower taxes and limited government is a winner, while big-spending liberalism invariably leads to financial ruin. 7 tháng 5, 2018 – Recent documents disclose how private money, from the Koch Brothers, among others, curtailed academic freedom at George Mason University, its Antonin Scalia Law School, and its associated Mercatus Center. ... George Mason, they also have a stable of Affiliated Scholars, scattered around . So, if we can accurately conclude that a state's level of wealth is associated with the dominant political party (BIG "if" ), how do we know whether the level of wealth was generated by the dominant party or whether the dominant party is chosen as a result of the level of wealth? And why would wealth be a measure of how well a state is run anyway? How about measuring education or elder care or animal welfare or environmental protection? Big deal if a state has money. It's how they got the money and what they're doing with it that counts. the current Republican POTUS is already having to bail out our farmers with billions of taxpayer money due to his cute little tariff escapades. Oh yes 4.1% GDP growth. RIGHT. While we're cutting food stamps for the handicapped and elderly. Someday soon maybe all of us will have had the experience of seeing an elder person cry because he/she lost a home and there's no money to pay rent or buy food. That's already happening, but will inevitably increase at an exponential rate as we factor in Trump's tariff-driven inflation. And who stands to gain from an inflated economy? Well, anyone with lots of real estate of course. Who do we know who has lots of real estate, like for instance golf courses and hotels and such? Edited 3 time(s). Last edit at 07/29/2018 07:35AM by suncloud.